Rated 4.0 out of 5.0 based on 408 surveys. Disney's version of a budget resort features three distinct themes executed in the same hyperbolic style. Spread over a vast expanse, the resorts comprise 30 three-story motel-style guest-room Buildings. 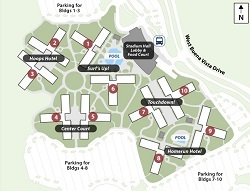 Although the three resorts are neighbors, each has its own lobby, food court, and registration area. The All-Star Sports Resort features huge sports icons: bright football helmets, tennis rackets, and baseball bats—all taller than the buildings they adorn. All-Star Sports has two pools, the Surfboard Bay pool at the Surf's Up! buildings and closest to the main lobby, and the Grand Slam pool, in the Homerun Hotel section. Guests at the All-Stars may use any pool at Movies, Music and Sports. Some rooms are closer to another resort's pools, lobby, and food court than its own. 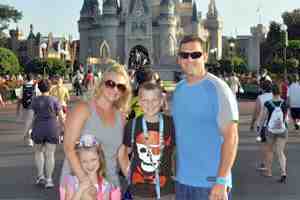 Sarah Stone's Mousesavers.com has a current list of Disney hotel discounts available at All Star Sports. Information on the other All Star resorts can be found at our pages for All Star Movies Resort and All Star Sports Resort. The All Star Resorts are slightly cheaper - and a little bit worse - than Pop Century. The All Star Resorts and Pop Century are slightly less expensive than the newer - and better - Art of Animation value resort. 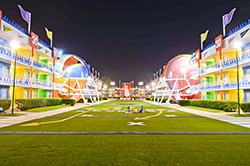 In terms of layout, architecture, and facilities, All Star Sports is similar to Pop Century, the All- Star and Art of Animation Resorts: 3- and 4-story, motel-style Buildings with a central pool, food court, and registration area. Look for Building-sized sports-related icons. A security gate guards the entrance to All Star Sports' grounds. If you arrive by car, you'll need to provide photo ID at the gate; it's not necessary to provide your reservation number or paperwork. A dedicated parking lot across from the lobby serves as temporary parking for those who need it while checking in. Stadium Hall is All Star Sports' lobby. In it you will find the check-in counter, concierge, Game Point Arcade, the gift shop Sport Goofy Gifts & Sundries, and End Zone Food Court. Check-in time at All Star Sports is 3:00 PM, and check-out time is 11:00 AM. All Star Sports participates in Disney's Online Check-In program, which allows you to you provide name, address, and credit card information up to 10 days before your arrival. If you've done this, look for an Online Check-In sign near the Registration Desk. You'll be routed to one of the Online Check-in staff and should be on the way to your room in a few minutes. If you have checked-in online and already have your MagicBand, the resort will simply send you a text with your room number when it is ready. Then you can go straight to the room and use your MagicBand to open the door, skipping the lobby altogether. If you've not registered online, look for signs pointing you to the Registration/Check-In area. You'll need to provide a government-issued photo ID and credit/debit card when you register. While parents are completing the paperwork, kids can unwind in a nearby area and watch a television showing classic Disney animated films. All Star Sports' registration staff can provide MagicBands for your stay, if you don't already have them. Get theme park tickets and dining reservations at the Concierge Desk, to the right of the Registration Desk. If you need to check in and obtain theme park tickets, you can save some time in line if one adult gets in line for tickets just after another adult starts the registration process. The Concierge Desk can also make Disney dining reservations, and you can avoid a wait there by making them online prior to arrival. Left: The hotel's lobby, called Stadium Hall. Right: Kids can watch class Disney animation in a special waiting area while parents check in. Guest rooms at All Star Sports are small at 260 square feet. Almost all All Star Sports rooms sleep 4, plus one child in a crib. 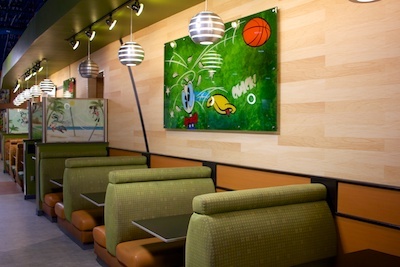 The decor is upbeat, with white bedspreads, themed-print duvet covers and wall art depicting athletes. Light-finish wood furniture and dark, patterned carpet provide an upscale touch, but these are not rooms you'll want to spend a lot of time in. At 260 square feet, guest rooms at the All-Star Resorts are very small. They're so small that a family of four attempting to stay in one room might redefine "family values" by week's end. Each room has two double beds or one king bed, a separate vanity area, and a table and chairs. Most bedspreads feature athletes; most light fixtures are star-shaped. No rooms have balconies. If you're planning to save for a Disney vacation, you may want to save enough for a bigger room at another resort if space is an important consideration. The All-Star Resorts are perfectly family-oriented. Some nice touches that were not mentioned in your guide—a small amphitheater set up in the lobby to occupy the kids while you check in, and soft sidewalk material surrounding the kiddie pool. And the playground has two separate jungle gyms—one for older kids and one for younger kids. The guide didn't prepare us for the large groups of students who take over the resorts. They're very noisy and very pushy when it comes to getting on buses. Our scariest experience was when we tried getting on a bus and got mobbed by about 100 students. We didn't know if our children would come out alive from the experience. We don't think we would go back to the All-Star Resorts for this reason (they offer packages to student groups). Also, the motel doesn't want to hear your complaints at all. I would never recommend the All-Star for a family. It was like dormitory living. Our room was about 1 mile from the bus stop, and the room was tiny. I'm in the hotel business, and it was one of the smallest I've been in. You needed to step into the bathroom, shut the door, then step around the toilet that blocked half the tub. We took our 1 year old son, 4 year old daughter (who turned 5 while we were there), and 9 year old son. We stayed at All Star Sports and LOVED every single minute of our vacation. We will come again and we will stay at All Star Sports again because it was very quiet, well maintained, and no problem getting to and from any place (we had our own car). The mini-fridge is a dorm-style unit that sit under a counter or desk. It's more like a beverage chiller than a refrigerator in that it'll keep drinks cool, but you're not going to freeze popsicles or make ice cubes in it. What you won't find in your All Star Sports room is a microwave, coffee maker (you'll need to stay at a Disney moderate resort or higher), or wired Internet access. All Star bathrooms are tiny. Almost all feature a tiled tub with shower, while some wheelchair- accessible rooms have a roll-in shower without tub. One nice feature in the standard bathrooms is a shower curtain rod that curves outward, so you're not always elbowing the shower curtain while shampooing. Water pressure in the shower is average - probably less than what you get at home, but still enough to get your hair clean. Eventually. A separate dressing area next to the bathroom includes one sink, but not much counter space. A 1500-watt, wall-mounted hair dryer is provided, but it's not very powerful. The dressing area includes a curtain that separates it from the sleeping area. Combined with the bathroom, this means that 3 people can get dressed at the same time. Bathroom, dressing area and sink in All Star Sports' rooms. All Star Sports has around 200 handicap-accessible rooms. Some feature roll-in showers, while others include assistive hearing devices. A subset of these rooms have been converted to comply with Florida's Accessibility Code, with changes to everything from bed, counter-top, and dresser drawer height, to door widths, wheelchair ramps, and more. Some of Sports' accessible rooms have the standard setup of 2 double beds; all rooms with roll-in showers have 1 king bed, and a small number of roll-in shower rooms have both 1 king bed and 1 double bed. Use our hotel room finder to see which rooms have which features. Disney knows that some hotel rooms are better than others. Most people prefer to be close to the lobby and dining, and want something pretty to look at from their hotel room window. To capitalize on this, Disney categorizes all of All Star Sports' hotel rooms based on how long it takes you to walk to the lobby, and what you see from inside the room. 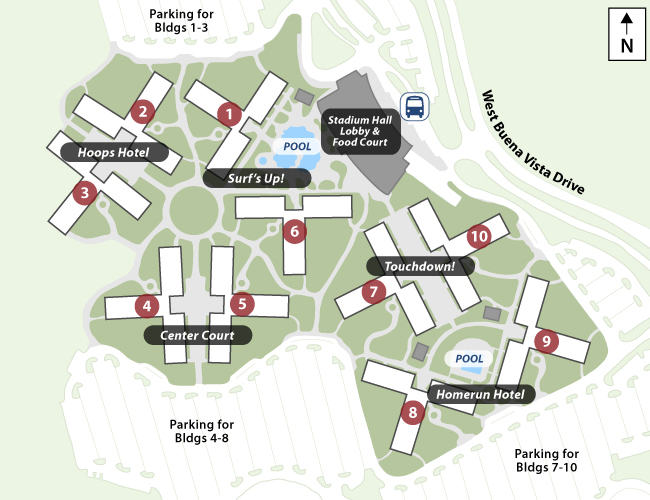 A Preferred Room is a room in buildings 1, 6, 7, or 10 that is close to the Stadium Hall Lobby and End Zone Food Court. The view from your window may include the pool, landscaping and trees, other buildings, maintenance areas, or be blocked almost completely by a giant decoration. Standard Rooms are found in All Star Sports buildings 2, 3, 4, 5, 8, 9. These Standard rooms are either a slightly farther walk to the lobby (an extra 3-5 minutes), and have generally unremarkable views of landscaping or parking lots. These are the cheapest rooms at All Star, but there are some gems to be found in this category, though, using our All Star Sports Room Finder. The other smaller pool, The Grand Slam Pool, is located near buildings 7 through 10. 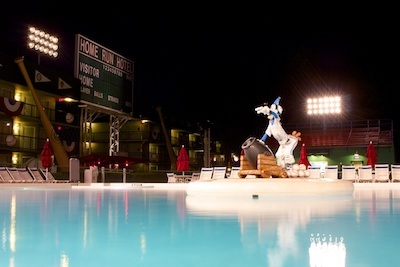 This pool area is themed like a like a baseball diamond, and features large bats and baseballs. The Grand Slam Pool is considered a "quiet pool," meaning that loud play and splashing around are discouraged. The Grand Slam Pond Pool is a quiet pool, free from loud play and splashing around. All Star Sports' pools range in depth from around 3 feet 6 inches/1.1m to 4 feet 9 inches/1.4m. Sports' pools are open every day, including winter. Pools are heated to 82F/28C throughout the year. We've swam in temperatures as cold as 40F/4C; the water was fine, but getting out was a shock. 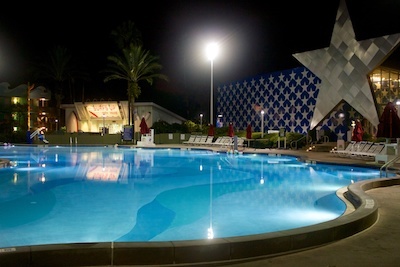 All Star Sports does not have a hot tub or jacuzzi; those are found at Disney's moderate and deluxe resorts. There are no water slides at All Star Sports' pools, or any of the value resort pools for that matter, but guests can find showers, storage lockers, restrooms, and laundry facilities at each of the two pools. Pool hours are at least 9AM to 8 PM, extending to as much as 7 AM to 11 PM during busy times. The Surfboard Bay Pool will have lifeguards during most of the day, but Grand Slam Pool will not have lifeguards at any time. Infant/child: Weight less than 30 lbs. Adult XS: Weight more than 90 lbs., Chest size 31-34 in. Adult S: Weight more than 90 lbs., Chest size 34-37 in. Adult M: Weight more than 90 lbs., Chest size 37-40 in. Adult L: Weight more than 90 lbs. Chest size 40-43 in. Adult XL: Weight more than 90 lbs., Chest size 43-46 in. Adult XXL: Weight more than 90 lbs., Chest size 46-48 in. Additionally, there may be a small supply of even larger vests. Inquire at your resort. You may need to bring your towels from your room to use at the pool - Disney sometimes stocks extra towels poolside, and sometimes they don't. Our advice is to send someone down to the pool to check the towel situation before you go. If you end up using your room towels at the pool, just call Housekeeping when you get back and request more. Pool toys are permitted in All Star's pools, including "pool noodles" (which you may find at the Sport Goofy Gifts & Sundries shop in the lobby), and basic toys that would be appropriate for water use such as rubber duckies and bucket & shovel sets. Some of us will occasionally bring something like a whiffle ball for playing catch in the pool. As long as you’re not disturbing other guests, you’ll be fine. Also note that kids with pool toys become very popular with other kids in the pool who want to play too. If you’re traveling with an only child and want him to have some age cohort interaction during your vacation, a nice strategy is to bring some extra toys. Chances are he’ll make a buddy. All Star Sports' Surfboard Bay Pool has a chair-lift device that can lower guests in wheelchairs into the shallow end of the pool. Check with any lifeguard for assistance on using the lift. A small playground set is located between the Surf's Up Building 6 and Touchdown Building 7. The set has two small plastic slides and a couple of sections with a few steps for toddlers to go up and down. There are no swings, and the entire area is covered in sand, so get ready to dump those sneakers out before you walk back into the room. 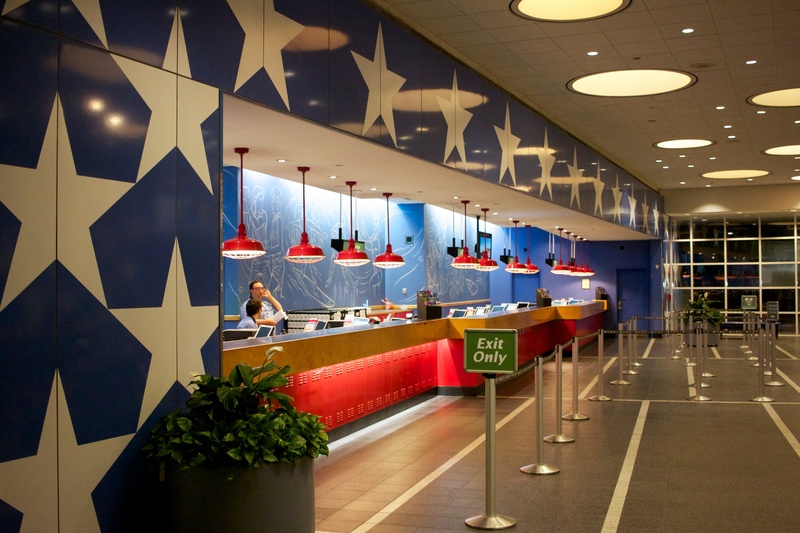 There's no full-service restaurant at any Disney value resort, including All Star Sports. End Zone Food Court is set up like a food court at a mall. There are 5 different stations, each selling one set of meals. For example, one station sells pizza and pasta; another sells burgers; another is dedicated to sandwiches, and so on. If your kids each want something different, you'll have to line up several times. The good news is that some of the food is prepared on demand, so you'll at least be getting your burger cooked to order. Prices range from $6 to $15 for an entree so you won't break the bank. We haven’t received any strong good or bad feedback on the entrees from the Lunch and Dinner menu. The pizza was especially bland and tasteless. The sandwiches like the Hot Italian and Meatball Sub were good but not great, but at least both are under $10. None of the desserts are particularly interesting but there is a nice assortment of ice cream sundaes and shakes. End Zone Food Court is set up like a mall food court. Seven different stations each serve a different type of food. A separate beverage station serves free refills on fountain drinks, coffee, and tea. 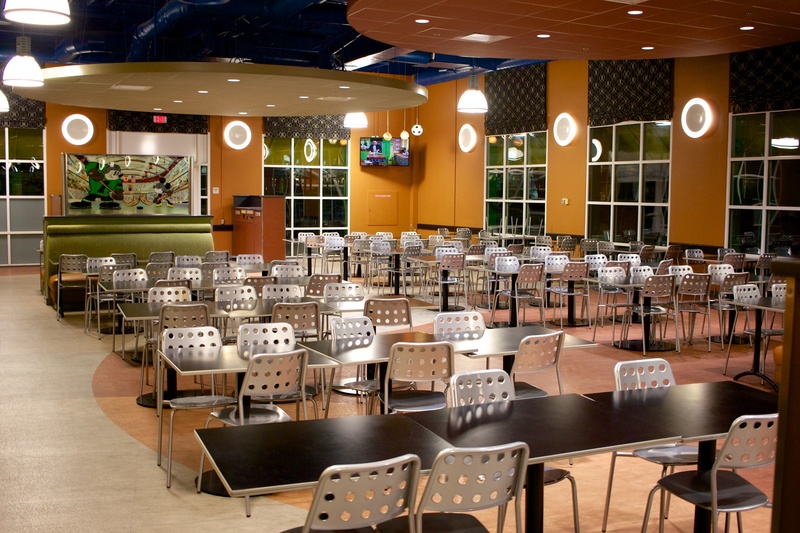 Free refills are available for coffee, tea, hot chocolate, and fountain drinks during your meal at End Zone Food Court. A huge beverage station sits just beyond the cash registers, and this station also provides toaster ovens, hot water, ice, condiments, and napkins. End Zone Food Court also participates in Disney's Rapid FillRapid Fill refillable mug program, where you purchase a souvenir plastic mug once, and get free refills for the remainder of your stay. The cost is a flat $17.99 for your length of stay. End Zone Food Court participates in the Disney Dining Plan; meals cost 1 Quick Service credit, and there are a wide variety of snacks to use as Snack credits on the Dining Plan. Pizza delivery is available to your room from Disney's own delivery service. Besides pizza, chicken wings, desserts, beer, wine, and sodas are also available. However, delivery can take up to 90 minutes, and the food quality is often below average. You're probably better off either walking to the food court or calling Domino's. Pizza delivery hours are 4 PM to midnight daily. A medium (16") cheese pizza costs around $14 and a pepperoni around $16. Minimum order is $15, and Disney will tack on an 18% tip, $3 delivery charge, and 7% sales tax. Thus, a $30 pizza order will cost you $40.50 delivered. Grandstand Spirits Bar Just outside of the food court and on the way to the Surfboard Bay Pool is the Grandstand Spirits Bar. Grandstand Spirits Bar has outdoor seating and a limited drink menu, with several beer selections, a couple of wines, and a small selection of spirits. It's fine if you want a Budweiser or strawberry margarita to relax with by the pool, or to get a nightcap on the way back to your room for the night. Grandstand Spirits Bar is usually open 12 PM to 12 AM daily, weather permitting. Driving Your Own Car Disney's All Star Sports Resort is just off of I-4 in Lake Buena Vista. Take I-4 Exit 65 - Animal Kingdom / Wide World of Sports and you'll end up on Osceola Parkway. Stay on Osceola for 2.3 miles, then turn left on Buena Vista Dr. Go about 0.4 down Buena Vista Dr, then turn right on to Stadium Blvd, which is All Star Sports' entrance road. You'll see All Star Sports' sign well before you need to turn. From Orlando International Airport If you're arriving at Orlando International Airport, Disney's free Magical Express bus service will take you and your luggage directly from the airport to your hotel room, then back to the airport when it's time for your flight home. For more information see our Disney's Magical Express Frequently Asked Questions page. From Sanford International Airport It's about a 50-minute drive from Sanford to All Star Sports. If you're not renting a car, be aware that Sanford's airport offers fewer transportation options than Orlando's, and Sanford's options are generally much more expensive. A taxi from Sanford International Airport to All Star Sports will cost between $120 and $150, depending on traffic. Mears Transportation offers 3-passenger towncar service to All Star Sports for around $140 each way, plus tip; 5-passenger SUV service or 10-passenger van is around $190 each way. That means round-trip transportation will run you somewhere between $240 and $380, plus tip, between Sanford and All Star. At those prices, it may be less expensive to rent a car and park it at the hotel. Getting to the theme parks, water parks and Disney Springs Disney provides free bus service from All Star Sports to the Magic Kingdom, Epcot, Disney's Hollywood Studios, Animal Kingdom, Blizzard Beach, Typhoon Lagoon, and Disney Springs. All Star Sports' bus stops sit along the front wall of the Stadium Hall lobby, between the lobby and check-in parking lot. Each theme park has its own bus stop somewhere along the wall. Animal Kingdom's bus service is shared with Blizzard Beach, while Disney Springs and Typhoon Lagoon also share a stop and service. All Star Sports shares bus service with All Star Music and All Star Movies. If you've got your own car, it's faster to drive yourself to Disney's Animal Kingdom, the Typhoon Lagoon and Blizzard Beach water parks, and Disney Springs. Disney's bus service is faster to the Magic Kingdom, Epcot, and Disney's Hollywood Studios. Each theme park has its own stop on All Star Sports' bus route. Ask a Disney Castmember about Sports' bus schedule, and they'll tell you that buses run about every 20 minutes. In reality, Sports' bus schedule varies considerably depending on the time of day and where you're headed. For example, if you're headed to the Magic Kingdom between 8 AM and 11 AM, you'll wait around 11 minutes, on average, for a bus to arrive. The bus schedules for Epcot, Animal Kingdom, and Disney's Hollywood Studios are about the same early in the day, with a bus arriving every 12-19 minutes, on average. Bus schedules to the water parks and Disney Springs are a little less frequent, and you could wait anywhere from 15 to 37 minutes for a ride. 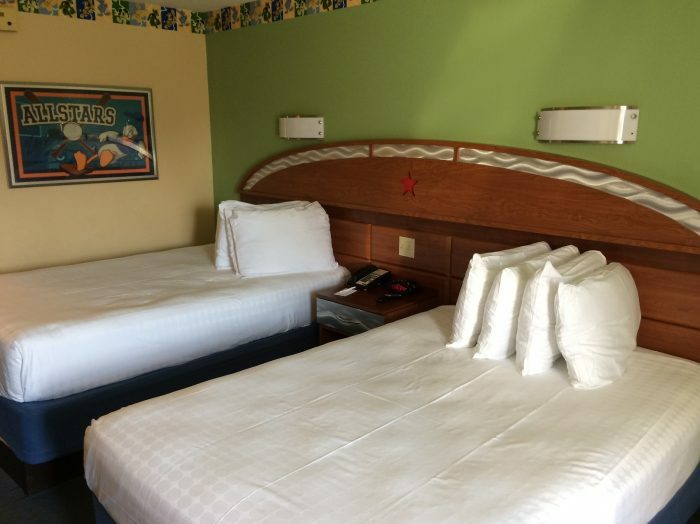 Getting to another hotel from All Star Sports If you've got dining plans at another Disney hotel, the cheapest option is to take a Disney bus from All Star Sports to Disney Springs, then take another bus from Disney Springs to your destination hotel. Do the reverse to get back to All Star Sports. While that's free, it can take anywhere from 90 minutes to 2 hours each way. If your destination is one of the Magic Kingdom monorail resorts, and the Magic Kingdom is still open, you could take a bus to the Magic Kingdom, then either walk (to the Contemporary and Bay Lake Tower), hop on the monorail (to the Polynesian and Grand Floridian), or take a boat (to Fort Wilderness, the Wilderness Lodge, and the Grand Floridian). We suggest you still allow at least an hour for that. The fastest option, however, is almost always a taxi from All Star Sports to wherever you're going; it's generally not more than a $20, 15-minute cab ride to get to most Disney hotels from All Star, and often less. Taxis are available outside the Stadium Hall lobby; if a taxi is not already sitting out front, the bell services desk also serves as a taxi stand, and they'll call one for you. To Universal Orlando If you're staying at Walt Disney World and don't have a car, Mears Transportation will shuttle you from your hotel to Universal and back for $18 per person. Pickup and return times are at your convenience. A one-way taxi ride is around $36, and may be the cheapest option if you have three to five people. Being a value resort means that All Star Sports doesn't offer many spectacular views. But there are a few rooms that are better than a parking lot. There's no large body of water near the All Star resorts so if you want a value resort with a lake view you should try Pop Century or Art of Animation. Building 1 doesn't have much to offer in terms of views. This major advantage of this Building is the short walk to Stadium Hall. Rooms facing southeast look out on to the Surfboard Bay Pool. All other rooms in Building 1 either face a parking lot or foliage. Good views in Building 1 include rooms 1X01-1X07 and 1X55-1X64 (replace X with the floor number). Rooms 1X08-1X10, which face a maintenance building. Rooms 1X11 and 1X32, which look out at a parking lot. Rooms 1X41-1X49, which show a service area. Room 1202: Looking out at The Surf's Up Pool. Room 1132: Right on the path to a parking lot. Views in Building 2 mostly face foliage or a small basketball-themed courtyard. Good views in Building 2 include rooms 2X01-2X10, and 2X55-2X64. Rooms 2X33, which faces a parking lot. Rooms 2X16-2X25, which show a service area. Room 2306: A view for those who can't get enough basketball hoops. Room 2150: The vast majority of rooms at All Star Sports have this view . Like it's neighbor Building 2, Building 3 is also surrounded by mostly foliage. Good views in Building 3 include rooms 3X01-3X10 and 3X55-3X64. Rooms 3X41-3X49, which show a service area. Room 3110: This motivational view reminds you to WIN. Room 3142: Hotel staff frequently park maintenance vehicles in these small service areas. Building 4 and 5 have a very small amount of good views, there are a few rooms facing East that look out on to a small tennis court with Disney characters. But other than that all rooms face foliage. Most of the views in this building aren't bad, they're just uninteresting. Good views in Building 4 include rooms 4X01-4X05, 4X07-4X09 and 4X60-4X64. Rooms 4X16-4X25, which show a service area. Room 4158: Looking out at the walkway between Buildings 4 and 5. Good views in Building 5 include rooms 5X01-5X10 and 5X58-5X64. Rooms 5X40-5X50, which face a service area. Room 5112: Not a great view but at least it's quiet. Room 5155: Facing the walkway between Buildings 4 and 5. Like its neighbor Building 1, Building 6 also has the advantage of being next door to Stadium Hall. It is also located next to the resort's main pool. This gives the rooms some nice views but some higher than usual noise levels. Good views in Building 6 include rooms 6X07-6X10 and 6X55-6X64. Rooms 6X01-6X06, which face that back of a maintenance building. Rooms 6X16-6X24, which face a service area. Room 6103: Good location, bad view. Room 6155: So close to Stadium Hall that you can touch it. Building 7 rooms facing East look out on a courtyard themed after a Football field. This does give some nice views but it also has the reputation of being loud as hoards of children play on the field. Good views in Building 7 include rooms 7X01-7X10 and 7X55-7X64. Rooms 7X41- 7X49, which face a service area. Room 7301: A nice view but that courtyard can get noisy. Room 7211: Not a great view but at least it'll be more quiet than the other side of the buidling. Building 8 rooms facing North look out on to The Grand Slam Pool. Good views in Building 8 include rooms 8X55- 8X64. Rooms 8110, 8106, 8110, 8156, 8160, 8164 which is blocked by a giant sculpture of a baseball bat. Rooms 8X40- 8X50, which show a service area. Rooms 8X33-8X34, which face a parking lot. Room 8133: You probably don't want to wake up to a parking lot every morning. Room 8255: Nice view of The Grand Slam Pool. Building 9 also faces The Grand Slam Pool. Good views in Building 9 include rooms 9X55-2X63. Rooms 9156, 9160, 9164, 9102, 9106, 9110 which is blocked by a giant sculpture of a baseball bat. Rooms 9X62, which faces a maintenance building. Rooms 9X16-9X25, which show a service area. Rooms 9X32 and 9X33, which face a parking lot. Room 9160: Don't you hate it when a giant baseball bat blocks your view? Room 9205: Good view of The Grand Slam Pool and Touchdown buildings. Building 7 rooms facing West look out on a courtyard themed after a Football field. This does give some nice views but it also has the reputation of being loud as hoards of children play on the field.. All other rooms either face a parking lot or foliage. Good views in Building 10 include rooms 0X01- 0X10 and 0X55-0X64. Rooms 0X16-0X25, which show a service area. Room 0119: A view of the building's service area. Room 0210: If you love giant footballs, you'll love this view. Rated 4.0 out of 5.0 based on 408 reader ratings.